Product Round-up Has anybody not trashed a digital camera at some point while out and about? Dust or sand, water or ice-cream, the great outdoors ruthlessly claims its tech victims on a daily basis. While manufacturers have busily carved out a niche of rugged ‘adventure-proof’ cameras, the truth is that most people, whether on the slopes, at the beach, or down the park, will find the extra hardiness of these cameras nigh on indispensable. So here are eight tough cameras taken through their paces. Chucked in rock-pools, frozen in ice and buried in sand – amazingly, they all stood up to their recommended stress levels – just about – at least on this round of abuse. None of the products claim to be child-proof, but having let a gang of kids let rip with the cameras on a playing field, it’s a given that they should stand up to such knocks and scrapes. 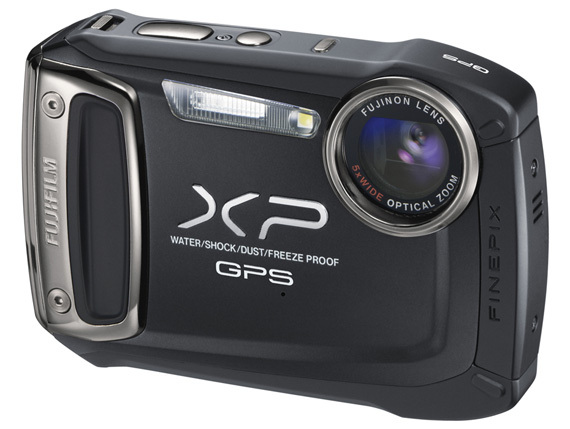 The Fujifilm XP150, Panasonic Lumix FT4 and Nikon Coolpix AW100 all include GPS functions and the Pentax WG-2 is also available with this feature. There are two notable absenses here as models are being replaced, so look out for new rugged offerings from Sony (the TX20) and Canon (the D20) when they appear in the next month or so. This model’s been knocking around for over 18 months, yet the futuristic body design – and slightly fiddly controls – still look fresh. The 12Mp sensor takes reasonably decent shots, though macro focusing is limited and colours aren’t especially vibrant. What really worries me about this snapper – and the reason to be ultra-cautious when immersing the Casio in water – is the door that hides the USB 2.0 port and SD slot. Or to be more specific, the dial that opens it. One small slip of the finger and it would open, with catastrophic results I’m sure. Not one for the aqua-inclined then. Casio needs to upgrade this model soon or drop it down into a lower price bracket. 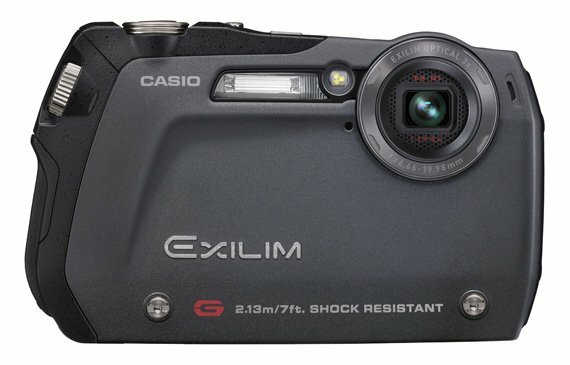 Thanks to Conrad UK for supplying the Casio Exilim EX-G1. The XP150 also likes displaying its GPS function, again with slightly over-zealous scrolling of locations. It tries to pinpoint businesses and tourist destinations which, in fact, leads to some inaccuracies. For instance, the camera proclaims you’re at a castle, which is actually a mile down the road. The XP150 will also track your route, along with compass bearings and altimeter readings, so its geo-location abilities are actually very impressive. A sturdy double-clip mechanism keeps the ports safe and sound, and the extra reminder on startup seems sensible considering this camera can be dipped down to 10 metres. The display is a bit of a let-down, and doesn’t do any justice to the fairly detailed, well-balanced shots that the 14.4Mp sensor can produce.